Doctor Who: THE TWELFTH DOCTOR #2.13 Review @comicstitan | Warped Factor - Words in the Key of Geek. 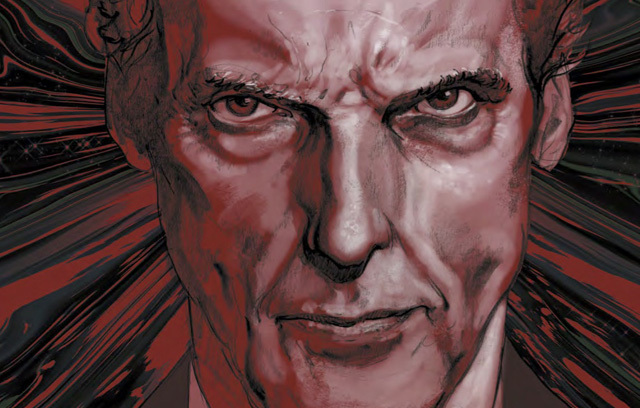 There’s a disturbing fact at the heart of this latest story arc for the Twelfth Doctor. All the stuff we think of as ‘the universe’ – the thousands of billions of galaxies, each filled with thousands of billions of stars and planets, accounts for about 4% of the universe. 4%. That’s just a little more than, say, the percentage of your body that’s made up of nitrogen. You might well notice if you lost your bodily nitrogen in a hurry, but it’s by no means the majority of what you’re made of. 73% of the universe is thought to be made up of Dark Energy, with another 23% being made of Dark Matter. 23%. 4%. You do the math. If Dark Matter happened to find itself a consciousness, especially a contemptuous consciousness, the universe as we know it, understand it and live in it would be doomed. But that’s the premise we’re dealing with here – for some, cosmologically convenient reasons, in 17th century France, with the extra-mortem figure of Cardinal Richelieu having traded in his life for a chance to become the flesh-vessel for living Dark Matter, and converted quite a few others to his way of thinking too – including Louis XIV, the Sun King. Bad news if you’re a fan of still being alive and human. The Doctor and Julie D’aubigny (known as La Maupin – and if you take nothing else from this comic-book, you’re gonna need to look her up in real world history, she’s ace) have thrown a cat among these Dark Matter pigeons, and are now talking and running, talking and running and wildly improvising a plan to stop the Cardinal and the King from using an imminent solar eclipse to open some Dark Matter portals in Paris and get the whole city on board with their possession gig. There are pros and cons to Robbie Morrison’s story of darkness rising. On the one hand, it has a distinctly Masque of Mandragora feel to it, waiting for planetary and stellar alignments to allow the arrival of a malignant force of darkness in continental, historical Europe, priests in particular being among the first to come under the alien sway and then passing on the infection by a kind of eye to eye communion. On the other, it’s a little in danger of associative overload, it simply ‘being dark’ through an eclipse being the key to opening Dark Matter portals, and both light and sound being inimical to the Dark Matter creatures. Nevertheless, having previously set up those rules, there’s a coherence and consistency in Morrison’s application of them here, with the Doctor Doing Something Clever to turn up the light, banish the Dark Matter creatures and find an excuse to deploy his shades again. There are treats in this story too. Certainly the Mandragora vibe is no bad thing, giving us a bit of swash and buckle, a bit of ‘darkness versus light for the future of humanity and the universe’ which chimes with the spirit of the age, and the spirit of Richelieu’s compulsions too. The characterisation of the Doctor and La Maupin is bright and breezy – you can certainly imagine the Twelfth Doctor’s lines in Capaldi’s voice, and La Maupin is a great addition; half Tegan, half Captain Jack, all feisty Frenchness – where’s the bad? The Dark Matter is given a solid voice here too, and a believable motivation for its actions, for all it comes off a little preachy: it’s been said that if you stare into the abyss, sooner or later, the abysss stares back into you, and that’s the idea here, the abyss looking back into us, seeing what we do and how we squander the gift of light and life in wars and folly. It decides we’re unworthy of those honours and determines to snuff us out. While it’s good to have a coherently expressed motivation for so esoteric an idea as conscious Dark Matter, its explanation does give us an additional kink in the storytelling, in that, as we mentioned, there’s more of it than there is ‘Light Matter’ in the universe, so there’s no real reason why, if it felt that strongly, it couldn’t just crush the Earth out of existence without warning, and without needing to manifest and possess people in 17th Century France. That there’s an explanation for that too, in that it was Richelieu that reached out and gave the Dark Matter its first portal into the Earth, works as long as you don’t stare at it for too long, as does the subsequent idea that the Dark Matter needs to open additional portals to let more of itself through. We’re helped along the way though both by the pace of Morrison’s storytelling and dialogue, and by the always exquisite artwork of Mariano Laclaustra. There are several different stylistic camps in the Who comics from Titan, and if there are favourites to be declared, we probably have to side with the realists – the likes of Lee Sullivan, Rachael Stott and Laclaustra, who give us a lot of artistic bang for our comic-book buck, in term of the precision of their environments, the realism of their characterwork, and the scale of the scares in terms of their villains. All three had a very good 2016 at Titan, producing outstanding work that added whole dimensions of enjoyment wherever they turned their artistic eye, and Laclaustra here proves he’s ready to keep delivering as we head into 2017. Given the kind of story this is, with a smokelike monster that emerges from people’s faces, and given it’s set in the opulence of Parisian palaces, the ostentatious grotesquerie of medieval stone architecture and the bawdy, salt-stained pleasurehouses of the poor, you need your full set of artistic chops if you’re going to bring it successfully to life. Mariano Laclaustra? Chop-central – there’s detail here, there’s a vision that seems to have been evolved from the brain to the page, layer by layer adding detail, adding movement, adding substance and reflection. Laclaustra is becoming a name to buy, sight unseen, a guarantee of quality and one of comic-book art’s finest relatively new talents. Here, he’s aided by Fer Centurion on colourwork, and Centurion too is no slouch in elevating the reading experience, bringing it to fully realised life and light. 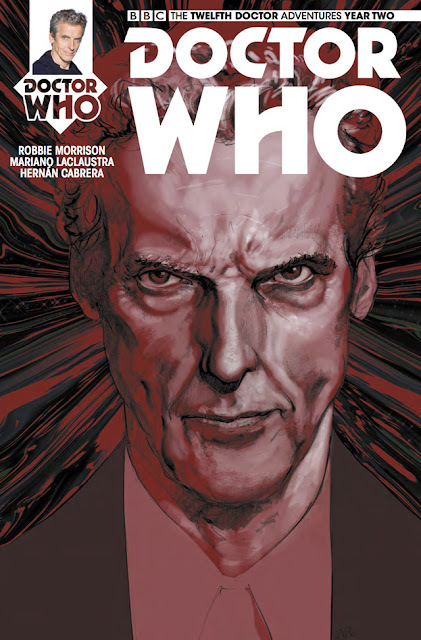 The Twelfth Doctor #2.13 is the culmination of a French pre-gothic romp that has plenty of scares, the philosophical underpinnings from Morrison given disturbing life by Laclaustra and Centurion. If you’re able to wink at some of the storytelling contrivances of the Dark Matter involving itself with humans in 17th century France (and facing facts, if you can’t wink at storytelling contrivances, what the hell kind of Who fan are you? ), it’s a cracking tale, energetically told and beautifully drawn. Perhaps its best idea though is pairing the Twelfth Doctor with Julie D’aubigny. The ending is unclear in terms of whether Julie disappears into time and space with our grumpy-cool Time Lord. We genuinely hope she does, because these two together have the kind of chemistry that can blaze a trail across the comic-book universe. Here’s to the next adventure, and to finding out!